Understand the principles of argumentation. Identify the parts of an argument. Understand the different types of arguments, and how to make an effective argument. Explain the techniques for creating and the benefits of having counter arguments. When you think of the word argument, you might also think of intense shouting matches where one person attempts to yell louder than the other person. You might imagine someone’s feelings getting hurt or relationships falling apart. Or, perhaps a scene emerges in your mind where one friend decides to stop speaking with another friend after an altercation. You might even think of physical violence. In general, people tend to have a negative impression about arguing, thinking that arguments are destructive and harmful. We want to avoid arguments. This chapter, however, takes a different approach to argument. As you will learn in this chapter, effective public speeches develop around arguments, and arguments do not need to be considered harmful things to be avoided. Instead, someone engaged in an argument gives logical reasons to other people—reasons that might enable those people to change their own minds about a particular topic or issue. This chapter will first equip you with some basic principles for understanding the importance of arguments in public speaking. Based on those principles, you will learn why speeches must have arguments and how to determine the success of an argument. Then, you will learn about the basic structure of an argument, so you have the tools to develop compelling arguments. The chapter will also discuss several types of arguments that you can make, and it will warn you several types of argumentative strategies that you will want to avoid. You will also learn about the significance of knowing what other people might think about your topic and why it is important to address other people’s potential concerns with your topic in your speech itself. Before we examine the structure of an argument, it might be helpful to first cover some essential principles of argumentation. These principles help us to be better equipped to answer the following questions: why do we argue? What is argumentation and what is an argument? How do I know that I have made a successful argument? There are four principles in total: (1) argumentation solves problems, (2) argumentation involves uncertainty, (3) arguments are a process and a product, and (4) success is determined by the audience. Why do we make arguments and why do we engage in argumentation? At the most basic level, we engage in arguments to solve problems. In your local community, you might believe that the roads are littered with too many potholes, so you decide to convince your neighbors and your local city council to raise taxes to fix all of those potholes. To convince your neighbors and city council members to make the change, you need to engage in argumentation. In other words, you need to give your audience, members of your local city council and neighbors, good reasons as to why they should make a change and taxes should be increased. What distinguishes argumentation from other ways to solve problems is that arguers will use evidence and logical reasoning to convince others that there is a problem and that they know the best way to fix the problem. [i] In public speaking, argumentation is not a zero-sum game where there is a clear winner and loser because the goal of argumentation is connection and problem-solving. In short, arguments are used to inspire action and solutions to fix problems. We can understand arguments as being both a product and a process. To view an argument as a product is to understand that an argument is something that is made and has a structure. As a public speaker, you will make an argument to convince someone to agree with your point of view. You will give evidence and use that evidence to make an argument about why your point of view is correct. However, arguments are something that you will also have with other people. Arguments do not occur in a vacuum. So, to view argument as a process means to understand that arguments happen in interactions with others. Through that process, you might tell your audience why you believe your evidence justifies a particular position over another, but your audience members might also tell you why they think their point of view is superior to others. Throughout that interaction and exchange of ideas and evidence, hopefully, you and your fellow arguers will arrive and agree upon the best course of action. In order for the process of argumentation to work, both you and your audience members have to be open to persuasion. This openness is known as the principle of reciprocity. True argumentation can only occur if both you and your audience are open to being persuaded and willing to admit that you may be wrong. [iii] You and your audience members have to be willing to examine the evidence and be willing to compromise. That is, engagement with others is necessary for productive argumentation. [iv] Otherwise, even though you might be exchanging points of view and evidence supporting those points of view, both you and your audience members will not be able to arrive at a collective course of action that will solve the problems you face. In short, arguments are things that we make (produce), but arguments are also things that we do with others (process). The principle of reciprocity is when both you and your audience members are open to persuasion. Being correct is not the same thing as having a strong or successful argument. Success is based on earning agreement of your audience. When we argue, it is because we want others to share our point of view and act with us to solve a problem. Ultimately, it is up to our audience to decide if they want to agree with our point of view and act collectively with us. So, even if we are confident that we are correct in what we believe, we cannot consider our arguments to be successful until we convince others to agree with our point of view. The process of earning agreement from your audience can be long and difficult. However, merely repeating what you believe to be correct will not foster a successful argument. It is not until you realize that your audience determines whether or not your argument is correct that you can begin to work to earn that agreement. As such, creating a successful argument often takes time, effort, research, and a willingness to engage with ideas and beliefs with which you disagree. Now that we have covered some of the basic principles of argumentation, let us examine the parts of an argument. Knowing the parts of every argument will help you recognize whether or not you are crafting an effective argument for your speech. A well-structured argument contains at least three parts: the claim, the data, and the reasoning. The claim is the initial statement with which you would like your audience to agree. The data is the supporting material and evidence that you present to your audience that you believe shows that your claim is accurate. The reasoning is the logical connection between your data and claim. In other words, the reasoning shows your audience why your data supports your claim. [i] For example, if you are attempting to convince your friend to go eat lunch with you at a local burger place, you might say “we should go to that burger place for lunch today.” You want your friend to agree with that statement, and it is thus your claim. Your friend might ask “why?” And, you might respond by stating “it has the best fries.” This statement is your data because it is the supporting material that you provided to your friend to prove that your claim (“we should go to the burger place”) is correct. Your reasoning is the logical connection between your claim and the data. In this case, your reasoning might be that “restaurants that have the best fries are the best places to eat.” This statement connects your data (that the burger place has the best fries) to your claim (that you should eat at the burger place). Thus, your complete argument: “Places that have the best fries are the best places to eat lunch. So, we should eat at the burger place, because they have the best fries.” This statement includes your claim, data, and reasoning. In everyday conversation, speakers do not always explicitly state the reasoning of the argument. When you talk to your friends about where to eat lunch, you might only say “we should eat at the burger place, because they have great fries.” If you ever said this statement, you would have only explicitly stated the claim and data. The reasoning is implied, and you would have assumed that your friends would understand the logical connection between having good fries and going to a place to eat. Based on this example, we might infer that not everyone will explicitly state their reasoning. However, for your argument to be effective, your audience needs to understand and agree with the logical connection between your claim and data. As such, if you do not state the reasoning explicitly, you must be confident that the logical connection is obvious enough that your audience will understand what it is. To be on the safe side, you should be as explicit as possible about how your data supports your claim in your speech, especially if your argument is complex or new to your audience. Remember that without a clear connection between your data and claim your argument will fall flat. The claim is the intial statement with which you would like your audience to agree. The data is the supporting material and evidence that you present to your audience that you believe shows that your claim is accurate. 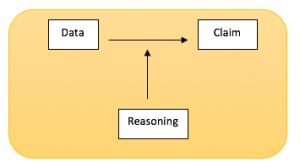 The reasoning is the logical connection between your data and claim. The basic structure of an argument includes a claim, data, and reasoning. To know how to develop as many diverse arguments as possible, it is helpful to know about the many different ways the reasoning process works in an argument. Let’s examine the different types of argument. Strong data is critical to developing strong arguments. To ensure that you include evidence in every argument, use the “because” test. The word because usually signals that a clause in your sentence will contain data supporting the other clause in the sentence. As such, one way to identify your claim and data is to add the word “because.” Examine the topic sentence of each paragraph (or main point) of your speech. If those sentences do not contain the word “because,” try to rewrite them to include the word “because.” If you cannot, then it is likely that your sentence needs data to support your claim and be a complete argument. Think of the burger place example once again. In this hypothetical, if your sentence was only “we should go to the burger place,” you will notice that you cannot rewrite this sentence to include the word “because.” As such, this sentence is only the claim. However, if your statement was “The burger place has great fries. We should go to it.” You can rewrite that statement as “we should go to the burger place because it has great fries.” This statement includes both the claim (“we should go to the burger place”) and data (“it has great fries”); the “because” in the sentence signals a connection between the claim and data. Understanding different reasoning patterns can help you construct better arguments. We will examine six ways you might reason as you develop and articulate an argument: (1) arguments by induction, (2) arguments from deduction, (3) arguments of cause, (4) arguments by analogy, (5) arguments by sign, and (6) arguments from authority. When arguing by induction, speakers take specific instances of an occurrence and generalize to a general principle based on their observation of those specific instances. [i] This process of going from specific instances and information to generalizing is also called developing an argument from example. During election seasons, pollsters use reasoning by example to make arguments about which candidate the general population prefers or wants to vote for at a given time. Pollsters ask a sample number of people to determine what they are thinking about the election. Based on the results from that sample, pollsters generalize and draw conclusions about what the general population thinks about the election and the candidates. When developing an argument from example, your data is a specific instance of a larger phenomenon. You might use your personal experience to make your generalization. For example, if you are giving a speech about the need for public libraries, you can use your personal experience of using the public library to use the internet, check out a book, or have a quiet place to work. Based on your personal experience (your data) of needing to use the library, you generalize (your reasoning) to make the argument that libraries are an essential facet of your community (your claim). Other types of data that might be relevant to an argument from example include testimonies of other and statistics. For instance, if you want to argue that the economy of your state is doing poorly, you might find statistics that three of the largest cities in the state have growing unemployment and have a shrinking economy. Based on those three statistics (your data), you generalize (your reasoning) to conclude that the economy in the entire state is likely weaker than it should be (your claim). If you decide to use inductive reasoning in your speech, you should ask yourself the following questions: (1) Do I have enough examples to support the generalization? (2) Will my audience members find my examples typical and representative? [ii] Your argument from example may not be persuasive without enough examples to support your conclusion. For instance, if you are giving a speech about funding for libraries and you tell your audience that you use the libraries, your audience will not accept your generalization that the library is important because many people use it. Instead, you could provide your audience with a statistic stating the total number of people that use the libraries to generalize that many people use them. Arguments from example also fail when the examples are outliers or isolated instances. You may not like chocolate cake, but that does not mean that we can then conclude that most people dislike chocolate cake. Whereas reasoning by example involves moving from specific instances to a general principle, when using deductive reasoning, speakers take a general principle and apply that principle to a specific case. For example, if you have evidence proving that in general students who attend a preschool do better in their K-12 education than students who do not, you might make an argument that your child should attend preschool so they can do better in their K-12 education. In this example, your claim would be that “my child should attend preschool.” Your data is the study you found saying, attending preschool correlates with more success in K-12 education. The reasoning that connects the data and claim is the belief that what is generally true for other children will be true for your child. When you make an argument that starts with a general principle and then apply that principle to a specific example, you are reasoning by deduction. The argument that King develops in this passage is one based on deduction. King starts with the data that the Declaration of Independence proclaims that all people are created equal. King then applies the general value principle established by the Declaration of Independence to the issue of racial segregation. When he does that, he can conclude that all races should be treated equally under the law and granted the guarantee of life, liberty, and the pursuit of happiness. Because the Declaration of Independence generally concludes that all people are created equal (data), King argues that in the specific instance (reasoning) of racial segregation that the law should treat all races equally (claim). When developing an argument from deduction, you need to be confident that the general principle on which you base your argument is accurate and that your audience will believe that it is accurate. If you do not believe that your audience will agree with the general principle, then you would want to include additional evidence justifying that the general principle is accurate before you apply that general principle to a specific situation. Arguments based on causal reasoning attempt to establish a cause and effect relationship between two items. So, based on an assumption about a relationship between the two items, your argument predicts that something will occur based on the data that you have. That is, you believe that one of the items influences the other items in some way. For instance, if a friend noticed you studying three hours a day for a whole week, that friend might make the following prediction: “you are going to do well on your exam because you have been putting in so many hours of studying.” In this example, your friend’s claim is that you will do well on the exam. The data is your friend’s observation of all of the studying that you have been doing. The reasoning in this argument is that a cause and effect relationship exists between studying and doing well on an exam. When speakers and audiences believe that one thing causes the other thing, they assume that the observation of one of the things allows us to predict that the other thing will occur. Another example of reasoning by cause would be the argument that “you should stop smoking, so you do not develop lung disease.” In this argument, the claim would be “you should stop smoking.” The speaker making this argument would be using causal reasoning because the argument assumes that a causal relationship between smoking and lung disease exists. The argument assumes that smoking does cause lung disease. To strengthen arguments by cause, you should clearly articulate evidence that supports the cause and effect relationship between the two items. 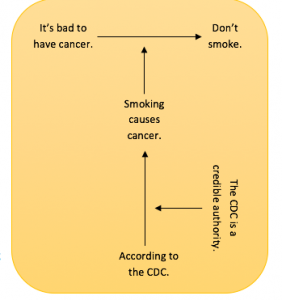 In the instance of the smoking example, citing evidence that establishes the connection between smoking and lung cancer would make the causal argument stronger. Moreover, strong arguments by cause usually include an explanation about how one item influences the other item. For instance, in the example about smoking, saying that smoking damages lung cells which increases the likelihood of lung disease explains to the audience how smoking and lung disease are connected. Causal arguments fail when they are based on correlation rather than causation. Correlation means that two things tend to happen at the same time—they have a connection. However, in a correlation one thing does not cause the other thing. For example, we may notice that college debt is increasing in the United States, and we may also notice that over the same period of time smoking has been decreasing in the United States. However, we cannot conclude that if more people smoked cigarettes, college debt would decrease. When two things happen at the same time, it does not prove that one causes the other. Arguments by analogy assume that if two items are alike in some respects, then they will be alike in other respects. As such, reasoning by analogy connects evidence to the claim by comparing to items. [iv] Take the following argument for example: “Sweden’s health care system dramatically reduced health care costs in five years. Thus, the United States should follow Sweden’s lead and adopt a similar healthcare system.” In this example, the claim is that the United States should adopt a health care system that is similar to Sweden’s. The data is a report that Sweden’s health care costs were reduced in five years. The reasoning connects the claim and data together. In this case, the reasoning is that because the United States and Sweden are comparable countries, what worked in Sweden should work in the United States. This type of reasoning relies on the belief that the two items (in this example, Sweden and the United States) are actually comparable in ways that are relevant to the argument. If members of the audience think that one cannot make a comparison between the two countries, then the reasoning process (and the argument) fails. Remember that when you reason by analogy, the two objects that you are comparing need to be similar and your audience needs to understand their similarities. The similarities also need to be relevant to your argument. If the two objects that you are comparing seem dissimilar, then it will be more difficult for you to convince your audience to take the “leap of faith” and accept your claim. Reasoning by sign is distinct from reasoning by cause because reasoning by sign does not attempt to show a causal relationship between the two things. That is, when you are reasoning by sign, you are not saying that “smoke causes fire” but that “from our observation of smoke, we can assume the presence of fire.” If we were to use reasoning by cause, we might state that: “because fire causes smoke, if I start a fire, there will also be smoke.” In the example of reasoning by cause, we infer something will happen based on the occurrence of something else. In the example of reasoning by sign, we infer something is happening based on our observation of something else. An argument from authority uses the expertise of someone as data to justify a claim as correct. This type of argument is one of the reasons it is important to cite qualified sources in your speech. The expertise of your sources justifies the arguments that you are making. Take the following argument: “Climate change is a real phenomenon because a vast majority of scientists indicate that it is real. In fact, in a peer-reviewed study, Doctor John Cook and his research team compiled scientific studies about climate change and found over 90% of scientists agree that the phenomenon is real.”[vi] In this argument, the claim is that climate change is real. The data is a study conducted by experts in the field stating that scientific consensus exists around the issue of climate change. The reasoning that connects the claim with the data is that what experts in their field indicate as true is likely to be true. When you reason by authority, you can either quote the authority figure or summarize the authority figure’s arguments. Regardless, you must also tell your audience who the authority figure is and why they are qualified to speak about the topic of your speech. When developing an argument from authority, remember the following: first, you need to make sure that the person you are citing is an expert in the topic of your speech. Someone might have a doctorate in literature, but that does not mean that their testimony on a scientific process is authoritative. Conversely, someone who has a doctorate in chemistry might not have the most authoritative voice when it comes to a speech involving books that have historically been banned from public schools. Second, the strongest arguments from authority generally do not rely on only one person’s authority. Instead, they rely on the testimony of multiple sources all of which are qualified to speak on the matter of your speech. For example, if you want to make a claim about the effect of increased carbon dioxide emission on plant life, a stronger argument would cite multiple independent qualified sources rather than just one source. Lastly, always remember to cite your sources out loud in your speech. Because your argument relies on the credibility of the people you are citing, you need to make sure you tell your audience your sources’ qualifications. Not every member of your audience will be persuaded by the same argument. Some people connect better with a clear example. Some people are more trusting of authority figures than others. Because of this, you will want to include several types of arguments in your speech. For example, if you wanted to convince your neighbors to increase taxes to reduce potholes, you might want to both include personal testimonies of people who say that they damaged their cars (reasoning by example) and evidence from car mechanics that detail how potholes can damage cars (reasoning by authority). When you include a few types of reasoning in your speech, the chance that at least one of your arguments will convince your audience of your thesis will increase. To strengthen your argument, you might use multiple pieces of evidence and reason in different ways to justify the same claim. Additionally, you might cite evidence to support the reasoning process of an argument in your speech. Recall the example above about convincing someone to quit smoking. If you said, “you should quit smoking because you do not want to get cancer,” you would be reasoning by cause. Your claim is the person should quit smoking. The data is that it is bad to get cancer. The argument assumes a causal relationship between smoking and cancer. Thus, the argument reasons by cause. Now, imagine that you made the following argument: “you should quit smoking because you do not want to get cancer. According to a report released by the Centers for Disease Control and Prevention (CDC), smoking leads to lung cancer.”[vii] In this statement, you have provided evidence supporting the reasoning of your argument. Think of the second sentence “according to a report released by the Centers for Disease Control and Prevention (CDC), smoking leads to lung cancer” as a new argument. In this argument, the claim is that smoking leads to lung cancer which is the reasoning from the first sentence of the argument. The data for the second sentence is the CDC’s report. The reasoning that connects the claim and data is reasoning by authority because the argument assumes that what experts state as true is likely to be true. So, when you are constructing your arguments for your speech, if you ever think that the reasoning of your argument is unclear or might not convince others, you should find additional evidence to support the logical connection between your claim and data. Inductive reasoning is when a speaker takes specific instances of occurrence and generalizes to a general principle based on their observation of those specific instances. Deductive reasoning is when speakers take a general principle and apply that principle to a specific case. Arguments based on causal reasoning attempt to establish a cause and effect relationship between two items. Arguments by analogy assume that if two items are alike in some respects, then they will be alike in other respects. When reasoning by sign, the speaker assumes that the observation of one item shows that another item is occurring. An argument that reasons from authority uses the expertise of someone as data to justify a claim as correct. Effective speakers recognize that their audience members’ points of view often differ from their own. As a speaker, you will, of course, attempt to prove that your point of view is the one that your audience should adopt. However, because audience members have their own points of view and beliefs about many issues, it is vital for you to brainstorm what those other beliefs and views about your topic might be and how you might address those beliefs in your speech. It might be easy to ignore divergent points of view, but doing so does a disservice to both your speech and your audience. As a speaker, you need to take other points of view into account as you develop your speech. To ensure that you are considering other points of view, your speech should address potential counter arguments. Counter arguments are positions with which your audience might hold that contradict or oppose your arguments. [i] For example, if you were to give a speech in which you argue that taxes should be increased to maintain public libraries in your hometown, someone else might think “why would we do that? No one uses libraries anymore.” The belief that no one uses libraries anymore may challenge the main argument of your speech. Thus, it is a counter-argument to your speech. It is important for you to remember that at least one counter argument will exist whenever you give a speech. If there are no counter arguments and everyone in the audience already agrees with your thesis, you would have no reason to deliver the speech. The best speakers, knowing there are likely to be counter arguments present whenever they speak, anticipate and respond to potential beliefs or positions that run contrary to their thesis. For instance, if you were delivering the speech mentioned above about increasing funding for libraries, you would want to tailor your speech to highlight why people might use libraries and provide data to support your claim. You might find reports that show people use libraries for internet access if they do not have internet at home, or you might also find newspaper articles that discuss summer reading program that libraries hold for children. You can then incorporate those pieces of evidence into your speech to address the counter-argument that people do not use libraries anymore. For instance, you might say something like this: “Some of you might think that not enough people use our public libraries to justify the increased expenditures, but a recent Pew Research Institute poll found that people still frequently use public libraries to check out books, take classes about how to use new technology, and use the internet to find jobs.”[ii] If you had delivered this statement, you would have referenced an opposing viewpoint (“not enough people use our public libraries to justify increased expenditures”), showing your audience that you are aware of potential positions that contradict your own. You also would have responded to the opposing position with evidence that shows your audience members why they do not need to be concerned about lack of library use. You can also address counter arguments is by establishing a value hierarchy. A value hierarchy prioritizes certain values and beliefs over others while still affirming all of those values and beliefs. For example, imagine that you are involved in a debate with another person about whether or not the United States should adopt a counter-terrorism measure and increase surveillance on its citizens. One side might argue, “No, we should not increase surveillance because that undermines our freedom and right to privacy.” The other side might argue, “Yes, we should increase surveillance because that will make us safer from terror attacks.” Both sides have constructed their argument based on the need for preserving a particular value. One side wants to preserve freedom, and the other side wants to preserve safety. Both positions can establish a value hierarchy to respond to the other side’s argument. For example, the person who opposes the counter-terrorism measure might say, “Although our safety is important, we must remember that we are fighting to protect the principles and rights on which our country was founded, including the right to privacy. Give me liberty or give me death.” In this statement, the speaker values the opposing side’s safety concerns but also indicates that the right to privacy is more important than safety. So, although the speaker agrees that safety is important, the speaker concludes that the counter-terror measure should not be adopted based on another more important value. Yet, the speaker who supports the counter-terror measure might also attempt to establish a value hierarchy. That speaker might say, “You are correct that privacy is important. However, to truly enjoy the benefits of living in a free society, we must all feel that we are safe. Without a feeling of security, we will never benefit from the freedoms we have.” This speaker establishes a value hierarchy by suggesting the safety is necessary for freedom, which takes counter-argument of needing to preserve freedom into account and addresses it. Therefore, when you are constructing your speech, one way you can address counter-arguments is by considering related values and developing a value hierarchy. In general, acknowledging counter arguments and responding to them makes you appear more credible to your audience members than if you simply ignored counter-argument. The first reason that this is the case is that addressing counter arguments makes you appear more knowledgeable about the topic and less biased. Explaining potential reasons that someone might disagree with your speech shows your audience that you did your research and tried to understand all sides of the issue as you developed your speech. Your knowledge enhances your credibility on a particular topic. Then, when you address the various sides of the issue, you show your audience that you took the time to consider other viewpoints and why your position is still the correct one. What this does is show your audience that you care about finding the correct solution to a problem, making you seem more trustworthy. The second reason that you should address counter arguments is that audience members who agree with the counter argument will view you with skepticism if you fail to address their concerns. For example, if you attempt to get a vegetarian or someone who wants to eat healthy to join you for lunch at your local burger place, they are unlikely to be convinced by your argument that the burger place has really juicy burgers. The vegetarian would probably think “but I don’t eat meat. What is in it for me?” And, the person trying to eat healthily might think, “but don’t those have a thousand calories?” Neither one of these people would be convinced by your argument because you have not addressed the counter-arguments. Just stating the burger place has great burgers may make these members of your audience feel that you did not care about their beliefs and values or, in another sense, whether or not you actually convinced them to go to the burger place. Without taking into account your audience’s beliefs, it can be difficult for you to establish a connection with your audience. Remember, a connection is necessary for you to persuade your audience to accept your point of view. Counter arguments are positions with which your audience might hold that contradict or oppose your arguments. A value hierarchy holds certain values and beliefs over others while still affirming all of those values and beliefs. Many potential pitfalls exist when you are creating arguments. These pitfalls, known as logical fallacies, are weaknesses in reasoning. As you read earlier in the chapter, every argument contains a claim, data, and reasoning that logically connects your data to your claim. In other words, when you craft an argument, a clear reason as to why your data supports and justifies your claim must exist. Without that clear connection, your argument will not make sense. Saying, for example, it will rain today because my finger itches does not make sense because there is not a clear connection between an itchy finger and rain. Logical fallacies are arguments in which there is not a clear connection between the claim and evidence, or there appears to be a connection between the two, but that connection is flawed. In other words, logical fallacies are weakness or flaws in the logic and reasoning of particular arguments. Logical fallacies are fairly common. They can occur in political speeches, in arguments with friends and parents, commercials, and advertisements. An important part of being a critical listener is being able to notice the weaknesses in arguments. And, an important part of being an effective speaker is being able to avoid logical fallacies and develop the strongest arguments possible. As such, learning to identify logical fallacies will enhance your critical listening skills as well as your ability to be an effective speaker. The strawperson fallacy exaggerates or misrepresents someone else’s argument to make that argument easier to refute. Recall the example from earlier in the chapter about giving a speech where you argued that taxes should be increased in order to pay for fixing potholes. Now, imagine that someone said, “all tax and spend liberals want is to take all your money and increase the size of government.” This statement is an example of the strawperson fallacy because your argument is not that the government should take all of the local townsfolk’s money. This person is exaggerating your argument to make it sound ridiculous and weaker than it is. The strawperson fallacy is a dishonest argumentative strategy because it fails to tell the audience the actual argument that needs to be refuted. It might be easier to “beat” a position if you misrepresent it, but doing so is unethical. Audience members who are familiar with the actual argument that you are refuting will know that you are exaggerating the argument and will view you with skepticism. The false cause fallacy assumes that if an actual or perceived relationship exists between two things, then one must be the cause of the other. That is, this fallacy assumes that correlation is causation. Thus, the false cause fallacy is committed when an argument is based on the mistaken belief that a causal relationship exists between two variables when no support for that relationship exists. When the false cause fallacy occurs in a speech, it is likely that causal relationship between the two variables has not been established or cannot be established. A Buzzfeed article posted in 2013 by Ky Harlin exhibits several interesting correlations and why you should not assume that one variable causes another based on a simple correlation. For example, Harlin’s article shows that there is a correlation between the amount of ice cream sold in a month and the number of murders that occur in a month. An argument using a false cause fallacy may claim that buying ice cream causes murder. Another example in Harlin’s article is a correlation exists between M. Night Shyamalan’s movie score on Rotten Tomatoes and total newspaper ad sales. [i] Assuming that people failing to buy newspaper ads makes M. Night Shyamalan worse at making movies would be a false cause fallacy. For each of these examples, other explanations likely exist for changes to each variable. In the case of ice cream and murder, perhaps the reason that both ice cream buying and murder increases in the summer is due to the weather or another variable entirely. Meaning “after this, therefore because of this,” post hoc ergo propter hoc is a subset of the false cause fallacy. This fallacy assumes that if Event A happened before Event B, then Event A was the cause of Event B. If you ever hear people make the argument that their itchy fingers mean it is about to rain, they are likely committing this fallacy. Imagine that your finger started itching and then ten minutes later it started to rain. If you conclude that your itchy finger made it rain, then you would be assuming that an event happened first and thus caused the second event to occur. Logically, there is not a connection between the two events unless you are able to prove that connection to your audience. In other words, pointing out that two things happened in chronological order is not proof that one is connected to the other. Your audience will likely see the two things as independent of each other unless you can provide an explanation of why they are connected. Meaning “to the person,” this logical fallacy is when someone attacks their opponent and does not respond to the opponent’s argument. Ad hominem is an attack on a person’s character, personality, or traits. For example, if you are trying to convince someone that college campuses should be tuition-free and that person responds by saying “you are stupid and have bad breath,” then that person has committed the ad hominem fallacy. This fallacy is a poor argumentative strategy because it distances the arguer from the audience. People generally avoid interacting with and listening to people who call them names or attack their character. Moreover, proving that someone else has bad character traits does not demonstrate to your audience that you are correct about a particular issue. So, instead of attempting to demean other points of view, use your speech to establish why you are correct about the topic to which you are speaking. Also called the forced dilemma fallacy, the either-or fallacy happens when someone presents two competing possibilities as the only two possibilities in a given situation. This presentation is a fallacy because it is likely that more than two possibilities exist. An example of this fallacy would be if a speaker argued for funding a new college by saying “either we fund this new college or it will close and our kids will never be able to attend college.” In that statement, the speaker only articulates two possibilities for what can happen. However, as you can probably tell, there are many other options for what could occur. Those kids could go to a different college, or funding for the new college could come from somewhere else. Using the either-or fallacy is a flawed argumentative strategy because members of your audience will recognize that other options exist. When members of your audience think of other options, you will lose credibility as a speaker because your audience will be able to tell that you did not take all other opinions and options about the issue into consideration as you developed your speech. Many issues are complex. Do not attempt to make them appear overly simplistic. Doing so does a disservice to yourself as a speaker and to your audience members. The hasty generalization fallacy is when a speaker reasons using examples but then jumps to a general conclusion without a sufficient number of examples. That is, the speaker uses examples to establish a general claim but uses too few examples to support that generalization. Moreover, the speaker might use examples that do not relate to the general claim that the speaker is attempting to make. Often stereotypes can arise because people reason using the hasty generalization fallacy. For instance, if someone made the argument that “one time I met a man wearing a red hat and he was really rude, therefore all men who wear red hats are rude,” that person would be using a hasty generalization to stereotype people with red hats. The hasty generalization is a weak argument strategy because members of an audience can often think of counter-examples that disprove the general claim. When making arguments based on examples, make sure that you have enough examples to demonstrate that your generalization is accurate. The bandwagon fallacy occurs when someone assumes that something is true just because many people believe it to be true. Thus, appealing to the popularity of an idea as its primary support is the bandwagon fallacy. For example, if you wanted to convince your audience to avoid skydiving and argued that everyone knows that skydiving causes death, you have substituted actual evidence for the assertion that everyone knows you are correct. Just because people believe something is true does not mean that it is the case. Remember that a lot of people used to believe that the earth is flat and that leeches effectively cured diseases. Do not rely on the popularity of an idea to demonstrate that the idea is correct. Logical fallacies arguments in which there is not a clear connection between the claim and evidence, or there appears to be a connection between the two, but that connection is flawed. The strawperson fallacy exaggerates or misrepresents someone else’s argument to make that argument easier to refute. The false cause fallacy assumes that if an actual or perceived relationship exists between two things, then one must be the cause of the other. Post hoc ergo propter hoc, meaning “after this, therefore because of this,” is a subset of the false cause fallacy. This fallacy assumes that if Event A happened before Event B, then Event A was the cause of Event B. The red herring fallacy occurs when someone introduces irrelevant information or topics into a discussion in order to distract from the topic or debate at hand. Ad hominem is an attack on a person’s character, personality, or traits. The either-or fallacy, or forced dilemma fallacy, happens when someone presents two competing possibilities as the only two possibilities in a given situation. The hasty generalization fallacy is when a speaker reasons using examples but then jumps to a general conclusion without a sufficient number of examples. The bandwagon fallacy occurs when someone assumes that something is true just because many people believe it to be true. In this chapter, you learned several principles of argumentation. As you now know, arguments are about trying to solve collective problems. When we need to argue, it is because there is something needs to be changed or improved. We argue to convince people that there is a problem and that we can solve it. This mindset creates conditions where people might actually work to change and fix an issue. Moreover, arguments occur when there is uncertainty about what should happen in the future. We argue in an attempt to create more certainty by highlighting which options for the future are the best options. Finally, you learned that the success of an argument is based on whether or not it earns agreement from the audience. This chapter also detailed the parts of the argument. Arguments contain these three parts: (1) the claim, (2) the data, and (3) the reasoning. The reasoning is the logical connection that shows why a particular piece of data supports the claim that a speaker is attempting to make. In addition, this chapter described six types of arguments that you might make in a speech: (1) arguments from examples, (2) arguments from deduction, (3) arguments of cause, (4) arguments by analogy, (5) arguments by sign, and (6) arguments from authority. It remains important to remember that your speech should develop several types of arguments in support of your thesis because certain types of arguments might be more persuasive than others. This chapter also defined and illustrated several types of weaknesses in arguments. These logical fallacies should be avoided when you develop a speech. Whenever you need to develop an argument, other people might have different points of view on the issue. Rather than ignoring other people’s points of view, engage them and explain to your audience why they should prefer your point of view. Also, be willing to change your mind. Argumentation is not about who can yell the loudest. Instead, it is about giving your audience good reasons to believe in your point of view and engage ideas with which you may disagree. You cannot force someone to change their mind, but you can give good reasons as to why they should change their mind. That is the purpose of argumentation.